I get a lot of questions about how to get your first break in humanitarian aid. It’s a topic that’s close to my heart, because I dealt with the ‘field experience’ catch 22 myself. I must have been turned down by pretty much every aid agency in the UK because I didn’t have any field experience. The route I took isn’t something I would necessarily recommend to anyone, but as I was going through some old photos I thought I would tell the story of how I got my first job in this field (over a series of posts). 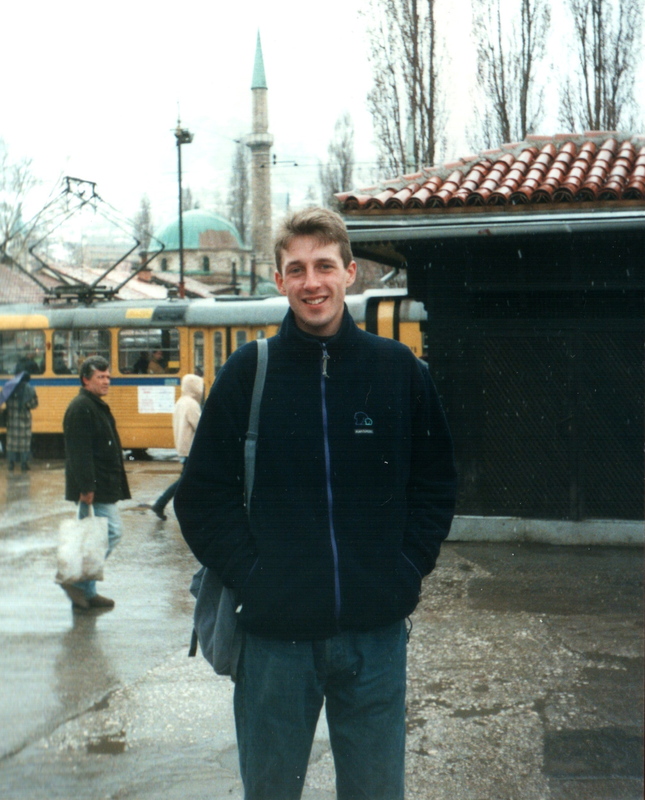 This photo was taken in the winter of 1996 – its me, in downtown Sarajevo, about a year after the end of the war in Bosnia and Herzegovina. After graduating from college, I was on the path to further academia, about to enroll in a PhD program. Stopping by at a friend’s house one morning I met a friend of theirs who had just returned from working as a logistician for MSF, and heard his stories of working on the Rwanda emergency. The conversation stuck with me, and ultimately derailed my academic career aspirations. I declined the PhD offer I had, and began to apply for jobs with international aid agencies. Depressingly, all of them declined me, the polite ones writing back to inform me that I didn’t have any field experience. Somewhat discouraged, that winter I decided to travel to Bosnia on my own to take a look around, and see whether this was something I was serious about. In retrospect I was woefully ill prepared, I didn’t have anywhere to stay, I spoke no real Serbo-Croat, and had no institutional support if anything had gone wrong. But, there we are – I’m smiling in this photo because I’d made it – I didn’t have job, but I was in the place I’d been watching on the news for so many years, surrounded by the circus of international assistance agencies and NATO soldiers. Hi Nick! Was really excited about the rest of this story – where is it? Hey Robin – thanks! I felt it was a little self-indulgent, to be perfectly honest, but here goes!